Of Colpoy’s Bay, peacefully at his home on Wednesday June 11, 2014. John Cecil Northey at the age of 68 years. Loving husband and best friend to Joan (nee McLay) for over 47 years. 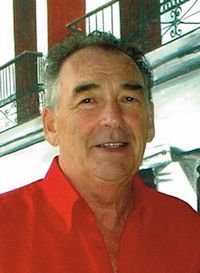 Cherished father of Tracey and her husband Kelven Arnold, of Wiarton, John “Jay” and his partner Rose Farkas, of Wasaga Beach, and Charolette Beirnes and her partner David Camano, of Sarnia. Proud Poppa of Victoria Arnold (fiancé Dan Mast), Kyle Arnold, Amber Northey, Sydney Northey, John Northey, Rachel Beirnes, Beau Beirnes, and Hannah Beirnes; and great-Poppa of Jesse Mast. Beloved brother of Doug (friend Gerrie), Bev (wife Marion), and Anna (husband Stan Panton), all of Peterborough, and Betty Florence, of Orangeville; and brother-in-law of Eric McLay (wife Carol), of Lion’s Head, Sharon Finlay, Terry Leonard, and Michael Leonard (friend Michael), all of Fenelon Falls. Sadly missed by his step-mother-in-law Doreen Leonard; son-in-law Shane Beirnes, of Kylsth; and by many nieces and nephews. Predeceased by his parents Cecil and Charlotte; in-laws Donald and Lenore McLay, and Peter Leonard; sister Joyce Lamonthe; and great-grandchild Emma Mast. Visiting at the Thomas C. Whitcroft Peninsula Chapel, 272 Berford St., Wiarton (519) 534-5341 on Friday from 2-4 and 7-9 PM. A service to celebrate John’s life will be conducted from The Meeting Place, 575 Edward, Wiarton on Saturday June 14, 2014 at 2 o’clock. Interment in Colpoy’s Bay Cemetery. Donations to LHSC Heart Research would be appreciated.